Today various far right groups (CXF,NWI,NF and BNP) tried to attack a march against racism and fascism starting in Toxteth. The march was organised by Liverpool Irish Patriots Republican Flute Band, in commemoration of local Trade Unionist James Larkin, the fash stopped a march by this group in February this year, claiming it was IRA. Obviously the fascists with little understanding of British politics can’t be expected to understand the difference between republicans and IRA or even the various IRA factions and splinter groups and differing opinions to the Good Friday agreement. The fash attempted to leaflet the local area and claim ‘The IRA are going to try and march through Liverpool’ it was obvious some members of the public believed this hype, what was also obvious was that despite that the fash had pulled from other areas, they had a poor turnout, and antifascists, mingled with the crowd and explained the position to many members of the public. Large banners made it clear that the march was actually against racism and fascism and many members of the community showed support for the march, despite best efforts of the fascists, they couldn’t stop the march, and so they tried to attack it. Again these attacks were foiled by militant antifascists on the outsides of the march who quickly dealt with the threat and forced the fascists away from the group. 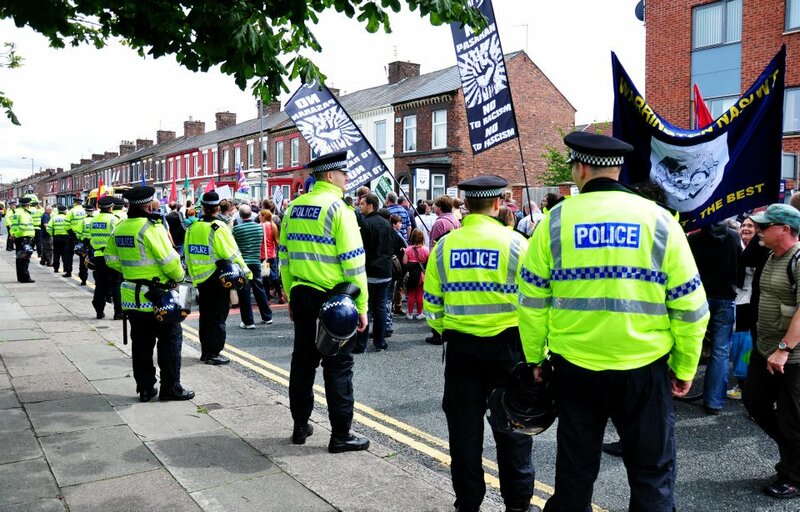 At the end of the march around 200 people made up of UAF, trade unions, the local community and various antifascist groups gathered to hear the speeches, and then went on to a social event, whilst fash went back to defending the boozer under the watchful eye of the police. One thing that needs to be noted here but I will address soon in a more detailed post is that wearing a vis-vest does not give you any kind of authority over others on their march, and people should not be so quick to do the police’s work for them, one blurt in a jacket in particular removed the hood of a young man who was in a scuffle with police, rather than assist in a successful de-arrest (as had happened several times throughout the day) this traitor took it upon himslef to remove the young man’s hood and then attempt to chastise him from wearing it, before swiftly being told where to go by the de-arresting comrades. Also on several occassions ‘protesters’ dragged antifascists off fascists and pulled them away, when the antifascists where simply defending themselves (and the march) from fash who had broke through police lines, again this is 100% unacceptable, how can people feel they have the right to interfere and do the police’s job for them? like I said this appears to be a recurring issue and I feel a lengthy post coming up about it. Today was a definite win for the organised working class in Liverpool, the march went ahead, we outnumbered the fash, any fash attempts at attack were sent packing and as far as im aware (at the time of writing) everyone got home safely.